Have a great cuddly weekend!! Awwwwwwwww! That is so cute. Thanks for starting our day with the Awww factor! Love it. awwww....our foster Amelia keeps trying to cuddle up with Maestro at night - we think he has just surrendered to it cause he finally stopped growling at her (getting up to leave would just surrender his spot on the bed - MOL). That's ME and Johnny! I love to sleep with my nose in his fluff. 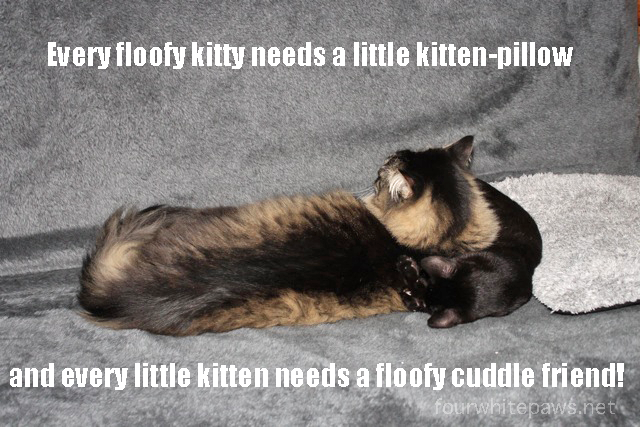 Cuddles are always purrfect! We are still sending Buddy lots of purrs. Awww! So sweet! Cuddly kitties are the best! Ha ha, makes me miss my fluffly Spritz whom I used as a pillow! He tolerated it well...and then he started to use me as his pillow. I suppose I had it coming!